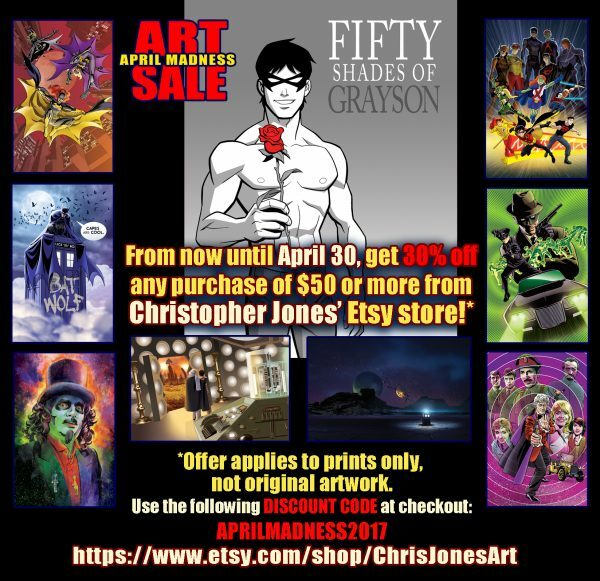 Christopher Jones Art Prints – 30% OFF sale! Forget “March Madness,” this is APRIL MADNESS! For those of you who don’t have the opportunity to see me at a comic convention or signing but want to pick up one or more of my art prints, my art prints are also available for purchase in my Etsy store. From now until the end of April, I’m holding an online art sale! This is your chance to pick up that Young Justice, Doctor Who, or other sci-fi/superhero print of mine you’ve been eyeing at a bit of a discount. April Madness 2017 Art Sale will run until April 30, and is good on combination of purchases of my 11″x17″ or 8.5″x11″ prints totaling $50 or more before the discount. This special discount does NOT apply to the original artwork available in my Etsy store, ONLY to my prints. Check out my Etsy Store at http://www.etsy.com/shop/ChrisJonesArt to see the full selection of art prints I have available. Use the discount code “AprilMadness2017” at checkout! Also, prints now ship inside the United States at just $5 for any size order, and there’s a combined shipping discount on international orders. Art prints all feature an original signature by the artist (yours truly) and can be personalized upon request. Doctor Who, Misc Artwork, Young Justice | Christopher Jones | April 3, 2017 5:28 pm | Comments Off on Christopher Jones Art Prints – 30% OFF sale! The late night horror host Svengoolie has been the on-air persona of Rich Koz since the mid-70s, and fans of his show know that it features vintage horror films served with generous helping of cheesy jokes along with background information on the films he shows and their stars that conveys a real love of the material. Ever since Me-TV came into the Minnesota market a few years ago, I have made sure to catch the show whenever I could. I really enjoy it. 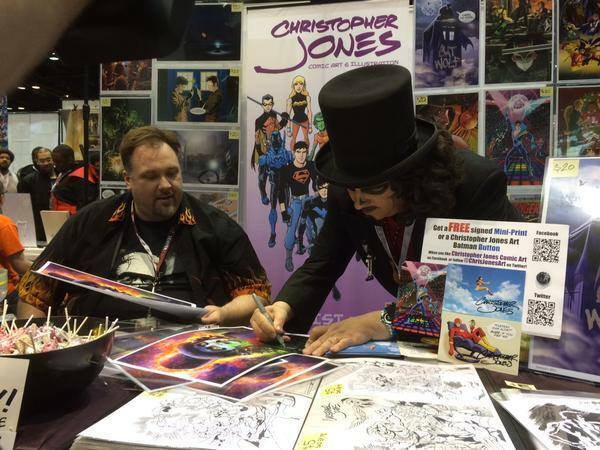 I didn’t know that Svengoolie would be at C2E2 last year until the 11th hour, and wrote on my twitter that I hoped to get away from my own Artists Alley table long enough to visit Sven at his signing, but I was skeptical that I’d be able to. Lo and behold, Sven and his camera crew stopped by my table as they did a tour of the convention, capturing material to be used in upcoming episodes of the show! It was tremendously cool! I did a little video with Svengoolie (which was really fun), and then gave him a gift of my Re-Animator print, which seemed like the most appropriate of the selection I had. Given the body of all ages and animation-based comics I’ve done I’m amused by how many people don’t know I got my start doing a lot of horror comics, including the original comic book adaptation of the Re-Animator film! Sven seemed to really like it, and I honestly don’t even remember that his crew was still filming when I gave it to him. 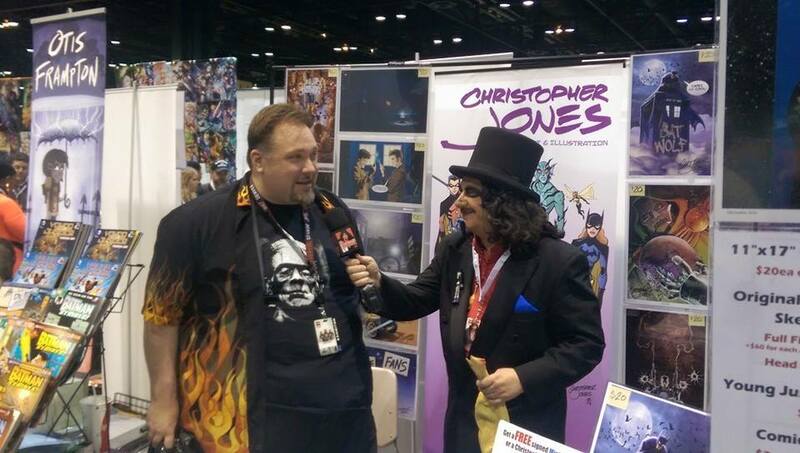 I determined right then that if I saw Svengoolie again at C2E2 in 2015, I wanted to do something more to express my appreciation for the show. It didn’t take me long to settle that would be fun to do a portrait of Svengoolie in a gothic, over-the-top haunted house kind of style. 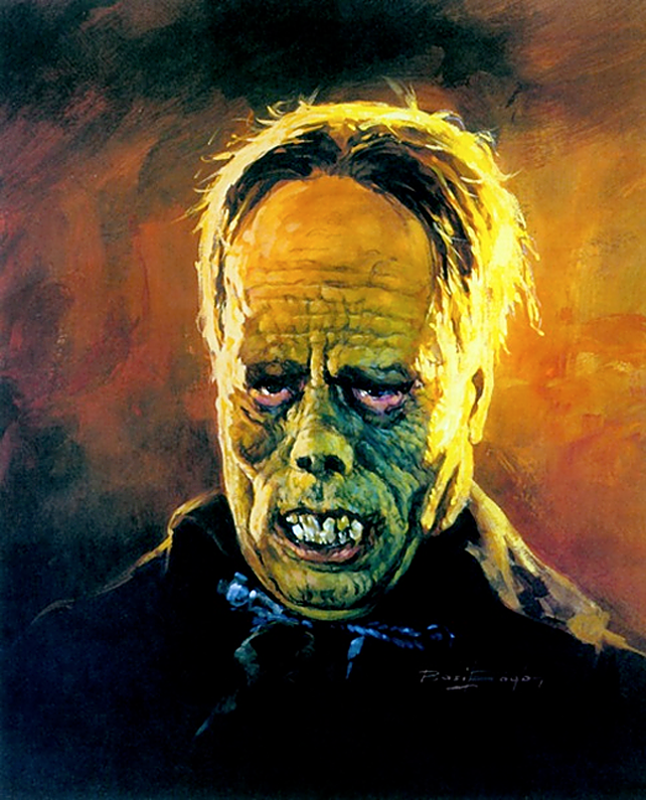 I got the idea of trying to evoke the style of Basil Gogos, who is best known for having done many great portaits of figures from classic horror as covers for Famous Monsters of Filmland magazine. Svengoolie seemed like a fitting addition to that gallery of ghouls, and the piece would present an interesting challenge for me. It was stylistically worlds away from my usual work, especially since I typically do hand-drawn line art with color added digitally, as opposed to the rich paintings done by Gogos. That said, I was delighted with how the piece turned out and hoped Sven would be pleased. 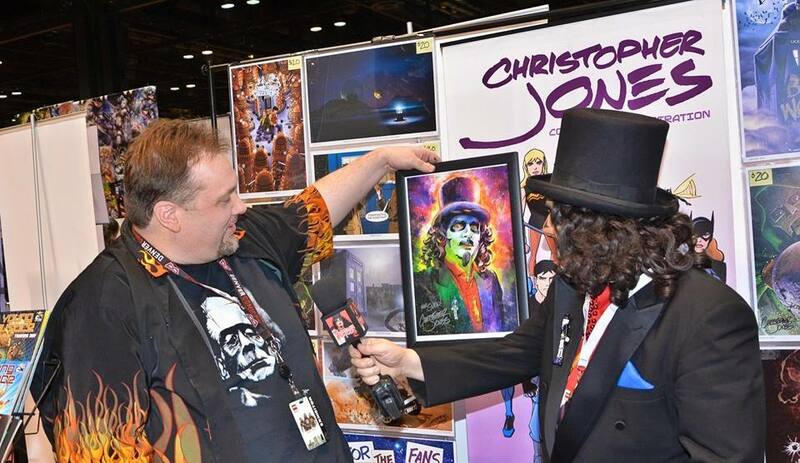 Hal reached out to Svengoolie producer Jim to share the finished artwork and see if it would be possible to surprise our favorite horror host with the gift at C2E2 this year. 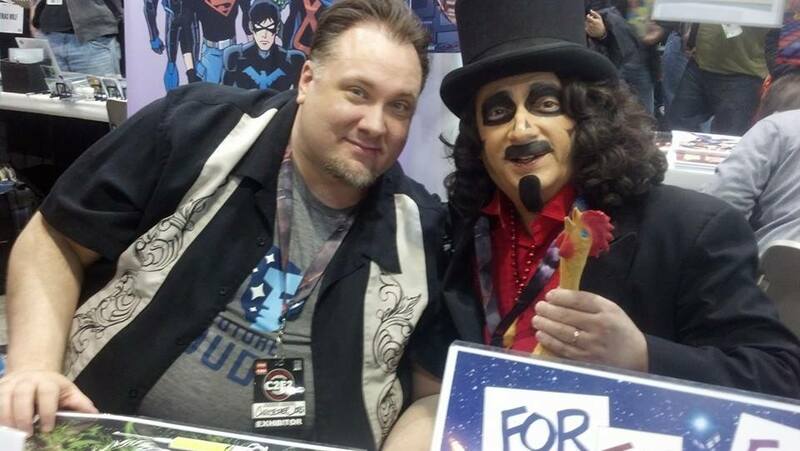 I spent the whole of Saturday at C2E2 2015 looking forward to Svengoolie’s visit after his scheduled signing. When team Svengoolie made their appearance, I was able to give Rich a framed copy of my Svengoolie portrait and he seemed delighted. I had a few extra copies for Jim and members of the Svengoolie crew, and made a point to get Sven’s signature on my own personal copy of the print for my living room. 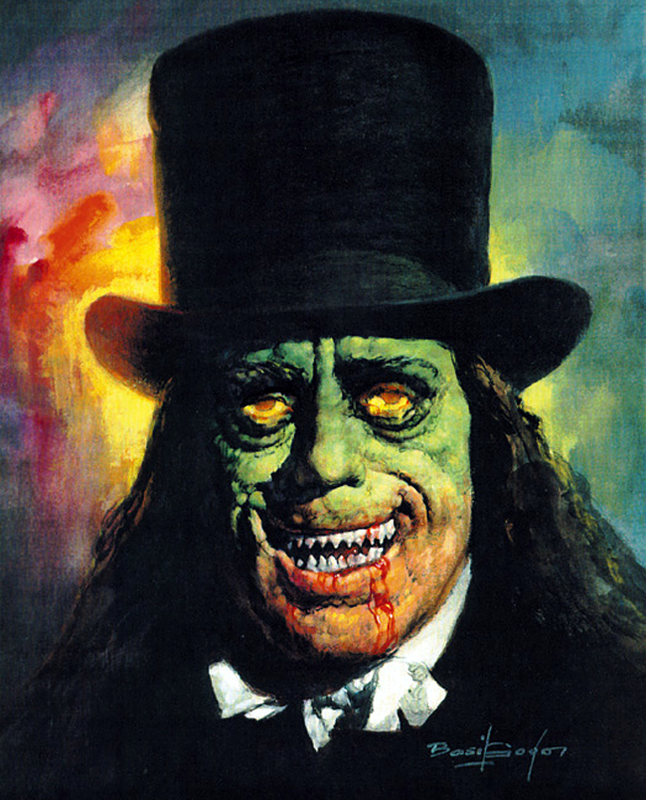 The portrait as it now appears on the Svengoolie set. Thanks to my friend Tom Hogan for capturing the video for me to screengrab. I’m pretty over the moon about this whole thing. 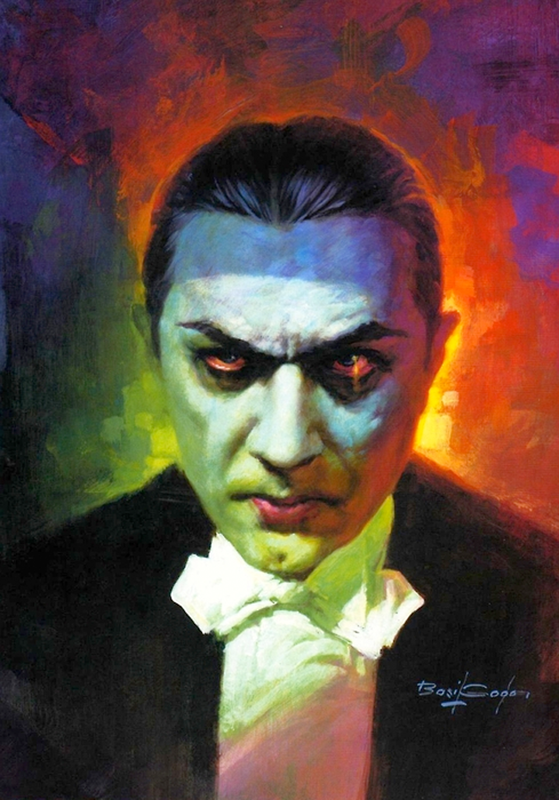 If you’d like your own copy of the Svengoolie portrait, yes, you can get one. If you can’t get to one of my convention appearances to get it from me in person, you can always purchase it from my Etsy store. I’m looking forward to seeing Svengoolie again, but I don’t know if I can top this!